Thomas Pennant (1726-98) was a naturalist, a traveller, and a writer. In addition to managing his family estate at Downing, near Holywell in North Wales, he wrote extensively on zoology, topography, and antiquities. His British Zoology led to his being elected a Fellow of the Royal Society in 1767, while his travels in Britain resulted in his publishing two Tours of Scotland, and various accounts of his tours in England. Walpole admired him, though he thought his works tended to be superficial, commenting that “he picks up his knowledge as he rides.” But he described him as honest and good-natured and even (“a credit to us antiquaries”) vivacious, and owned a number of his topographical works. One of these was a copy of Pennant’s Of London (1790), an anecdotal antiquarian tour of the capital. He wrote on the title page “With MSS. notes by Mr Horace Walpole,” and added some notes in ink to the text, but then provided seventeen further manuscript pages headed “Additional Notes,” which are bound in at the end of the book. The pages of notes bound in at the end of the book are arranged by streets, and one of the pages is headed “Notices from my MSS. 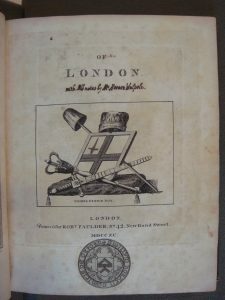 collections for anecdotes of the streets of London”, while the last two pages are devoted to London’s Clubs. These notes are not tied to Pennant’s text, but are used by Walpole to expand it. 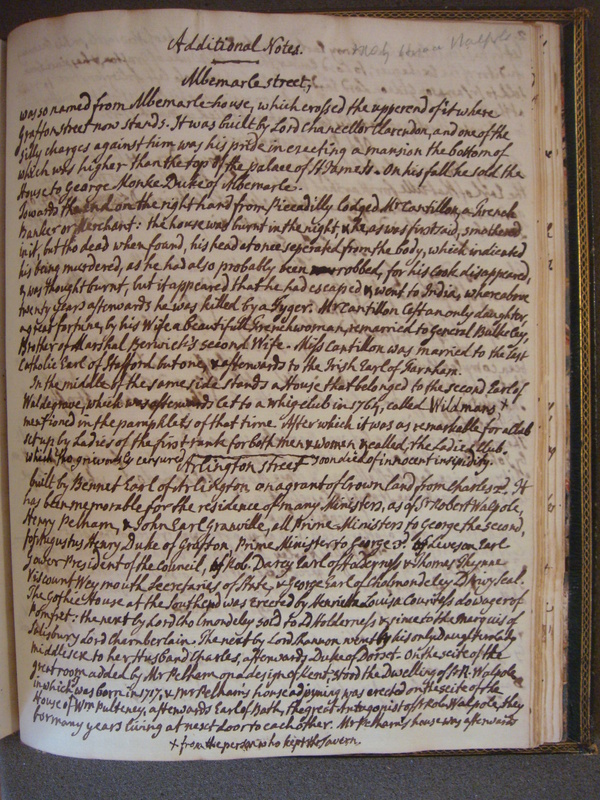 He records the ownership of houses and their histories, as of a property in Albemarle Street, “let to a Whig Club in 1764, called Wildman’s… After which it was as remarkable for a Club set up by Ladies of the first rank for both men & women & called, the Ladies Club, which tho grievously censured soon died of innocent insipidity”. An account headed “Cheapside” begins with a note of its displays of chintzes and oriental porcelain, but veers off to anecdotes of Queen Caroline visiting one of the India warehouses there, and then on to members of the Court attending theatrical events; and from there to the limited number of entertainments that ladies could attend unaccompanied, and then again on to Vauxhall and Ranelagh and London’s other pleasure gardens. The interest of the notes lies in the way they fill out the historical record. Walpole aptly summarized his motive in annotation with this final note: “These slight notices may explain many passages in the poems & pamphlets of the Time, which without such a key might be very obscure or unintelligible; & to later times, if such trifling notes shoud happen to last, woud represent some striking manners of the Age.” But more than that, in their flow and variety and diversity they suggest something of Walpole as conversationalist, entertaining his company with an apparently boundless flow of anecdote. 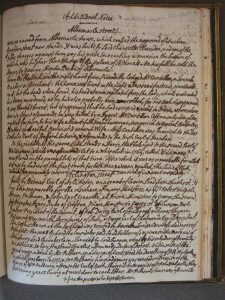 This entry was posted in Books, Manuscripts and tagged eighteenth-century, includes Walpole's annotations, Lewis Walpole Library, owned by Horace Walpole by Susan Walker. Bookmark the permalink.